Three pounds of cut potatoes is the most that will fit onto a large rimmed baking sheet without much overlap; any more and browning will be affected. If serving with Fennel-Stuffed Roast Pork Loin, cook in tandem with the meat by simply placing the baking sheet onto the bottom rack when you put the meat in and slide the potatoes into the oven when the oven temperature is increased in step 4. Be very careful with the hot baking sheet. Wrap garlic head in foil; set aside. Adjust oven rack to lowest position, place large rimmed baking sheet on rack, and heat oven to 450 degrees. In a large mixing bowl, combine the potatoes, oil, bay leaves, chiles if using, and a generous sprinkle of salt and pepper. Toss well to combine. 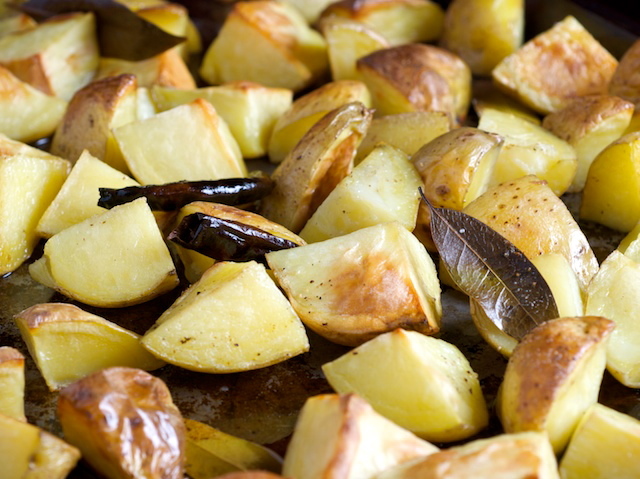 Carefully flip potatoes with a thin spatula and return to oven. Roast until golden-brown and cooked through, about 15 minutes longer. Remove bay leaves. Unwrap garlic and, when cool enough to handle, squeeze cloves from skins. Chop coarsely and mash, then scatter over potatoes along with thyme and additional salt and pepper to taste. Serve. Read more about potluck party planning in Matthew Card's "How to host a potluck."